It’s a bitter pill to swallow, but some of the brands we think are the good guys might actually fall short of their #ecogoals and may even be guilty of greenwashing. In the Trump era of fake news, we’ve uncovered a lot of partial truths. Brands that are billing themselves as ethical, sustainable, and philanthropic – three buzz words that shoppers look for more and more when shopping – provide little evidence to support their sustainability claims. H&M’s Conscious Collection sounds and appears sustainable, using keywords such as ‘innovation’, ‘minimal environmental impact’ and ‘regenerated fiber’. However, H&M provides scant information to back up its eco-claims. As an example, the collection includes a list of suppliers, but no explanation of the factory conditions. The collection emphasizes eco-materials, yet most of the products are only partially made with eco-materials, and therefore not recyclable. The focus of the collection is heavily environmental without any information on whether the products are made in a humane way. As the Clean Clothes Campaign points out, “Without concrete data, H&M’ s sustainability reporting is nothing but a string of empty words and an attempt to divert attention from their 2013 unfulfilled commitment to pay living wages”. This stylish clothing brand has a commitment to social and environmental responsibility and makes the majority of its clothing locally in Los Angeles. They pay above minimum wages and provide healthcare for all full-time employees. Reformation scores big points with us for having a smaller carbon footprint, using less water, and less waste than the industry norm. Plus, they transparently share data in an easy to understand way with shoppers using the RefScale, a measurement system that tracks the environmental footprint of each product, including the pounds of carbon dioxide emitted, gallons of water used, and pounds of waste they generate. (The RefScale is available on each product’s page). They differ from brands like H&M Conscious Collection by offering more transparency about their products and practices. You can even tour their Los Angeles factories and meet the people who make your clothes. 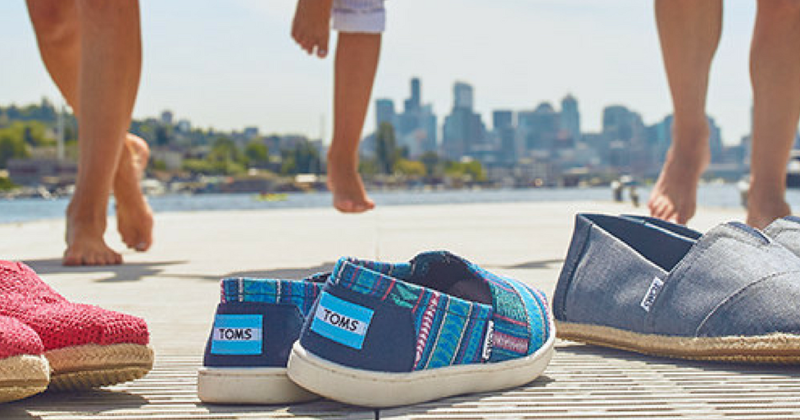 TOMS shoes have an avid following for being comfortable and doing good. Shoppers love their social mission and one-for-one shoe model, for every shoe you buy, a “person in need” gets a free pair. Sounds great right? But studies show that these give-back models are not sustainable and actually hurt local economies. TOMS is not transparent about the working conditions of their shoes, simply sharing a generic supplier code-of-conduct and language around auditing factories. To be truly mission based, TOMS would be well served to invest in the communities of makers who make their shoes and to create jobs with dignity. In addition very few of their shoes use eco-friendly and biodegradable materials, which means TOMS end up clogging landfills. 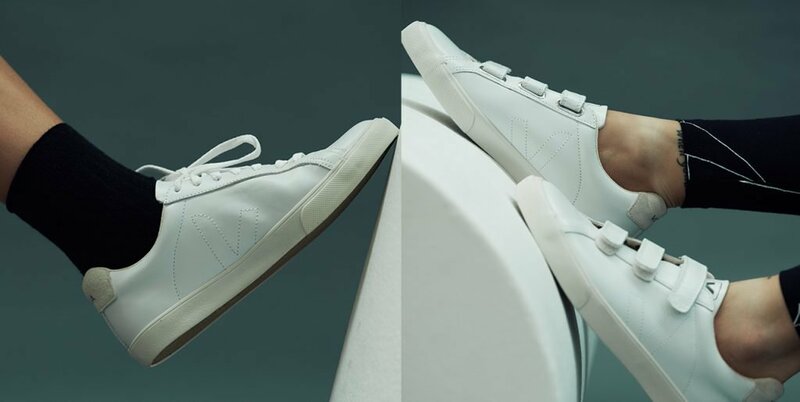 Veja is a pioneer in the sustainable shoe space. The brand was started as a direct response to the lack of ethically produced shoes in the market. They work with organic cotton farmers (whose crops are cultivated without chemicals or pesticides), use wild rubber from the Amazonian Rainforest to help fight deforestation, and tan their leather using natural acacia extracts rather than heavy metals, helping to decrease pollution. They also make sure that their suppliers and employees are well paid —even sacrificing their marketing budget (instead of makers’ wages) to keep their shoes affordable. 80% of their factory workers are union members, get paid leave and transportation. They speak openly about the importance of sustainability, and provide not just the names of their green suppliers but actual audit reports, demonstrating how sustainability is truly integrated in their business model. Bravo! AG Jeans is a Dutch denim brand that has been getting a lot of positive press lately. While we commend the brand for their use of sustainable fibers and their efforts with accountability standards, supply chain transparency, and waste reduction, the brand doesn’t provide any concrete data on their environmental or social impact. AG Jeans makes reference to their Code of Conduct, but does not provide any specific data that backs up how they implement and measure the initiatives they list on their site. If the brand traced their supply chain, and provided audited information publicly, it would be a solid boost to their ethical cred. Known to last for the long run, Nudie Jean aficionados are encouraged to wash their denim less and repair rather than throw away their jeans. In addition to their lasting endurance, the brand backs up their sustainability claims by sharing audit data publicly including water use, C02 emissions and working conditions. The company also commits to checking in on their subcontractors, and is constantly striving to improve their ability to provide a living wage. Nudie Jeans is certified by the Global Organic Textile Standard (GOTS), which is a leading textile processing standard for organic fibers. Lastly, the company makes good on their promise to make their denim last by providing repair shops all over the world. Now that’s a pair of jeans that we commit to having a long-term relationship with! Ready to discover more ethical brands that are for real? Head to our SHOP here! Ruby Veridiano, @rubyveridiano, is a fashion change-maker focused on connecting the dots between women’s empowerment and socially-conscious fashion. She is Remake’s Paris Ambassador and a contributing correspondent for NBC News, NYLON Magazine, and Mic.